We welcome you to the webpage of Mary, Cause of Our Joy Phoenix Arizona Chapter of Magnificat. These are exciting times that we live in and Magnificat was begun in 1981 for such a time as this. There are now over 100 chapters throughout the United States and its territories and in many foreign countries. Janet has been a devout Catholic her entire life, having been raised by a wonderful mom and dad. Her father was in the Navy, so she traveled up and down the East Coast in her younger years. She attended Catholic grade schools and then the San Diego College for Women, known as USD. She is married to Kirk, the true spiritual head of their household. They have four children and six grandchildren. She has written a book titled “My Children’s Children.” A collection of Janet’s stories that show us how we grow in our spirituality through our relationships and experiences and how people reflect God’s love back to us. Her book can be found on Amazon. 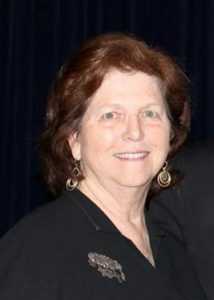 Janet has been a leader of many organizations which includes PDCCW, now known as Catholic Women of Phoenix. She now serves as President of Radio Family Rosary. Janet coordinates and hosts Catholic pilgrimages. Her future pilgrimages are October 2019-a Divine Mercy Pilgrimage to Lithuania and Poland; in 2020 to the Oberammergau Passion Play in Germany also visiting Switzerland and Liechtenstein. Her devotion to Our Lady is an important part of her life and has brought her many blessings. We do not assign seats so arrive early to check in at the Reservation Table & find seat(s) before the program begins. Personal Prayer ministry is available after the meal by the Magnificat Prayer Ministry and the Diocese of Phoenix CRM (Catholic Renewal Ministries) Prayer Teams. Tickets to the meal are $15.00 Your check will serve as your receipt and for all registrations, we will have an electronic record of your purchase and your name tag at the door. Ticket sales end Monday, May 6, 2019 at midnight. Tickets for priests, deacons, religious brothers and sisters are complimentary, but reservations are required. Contact our Treasurer, Esther Ramirez at 623-565 0304. If you are unable to afford a ticket but want to attend the meal, please e-mail Maureen Kight will be made for your ticket. Tickets are $15 and must be purchased in advance to secure your reservation. No tickets will be sold at the door. Your check will serve as your receipt. Please use this form for Mail-In Reservations ONLY. Complete the form below (include the names and phone numbers of other ticket holders in your group). Reservations CANNOT be accepted after February 11th. Remember our chapter’s commitment to Eucharistic Adoration and to pray the Rosary on the 14th of each month for the intentions of Magnificat, Sanctity of Life, Marriage and Family, and World Peace. If you would like to help with a Ministry of Magnificat, or if you have a question or comment for our Service Team, or if you would like to be on our Mailing list for future events, please contact Maureen Kight at maureen.kight@yahoo.com. The spark for the Phoenix Chapter of Magnificat came on the evening of September 19th, 2010. It all began when founding Coordinator, Laurie Walsh met Carolyn Wright who gave her a brochure at a Charismatic Conference in Phoenix. Laurie had just retired and was at the conference specifically asking God, “Do you want me to start a ministry?” Within moments, Carolyn who was a total stranger up to that moment, was prompted by the Holy Spirit to hand Laurie the Magnificat Ministry brochure. From that day on, Laurie, Holly Burke and Cathy Cato began holding discernment meetings in the Diocesan Offices in Phoenix. They completed all of the requirements to become a Chapter and during this time, many women came in and out of the meetings. Just before the first meal, Mary called the two women, Maureen Kight and Sharon Wnuk, who would come aboard to complete the service team of five women. The inaugural meal was held five years to the day after the meeting took place between Laurie Walsh and Carolyn Wright; Sept. 19, 2015. Carolyn flew out from her chapter in Birmingham, AL to surprise the team and be in attendance. The first speaker was the regional representative, Barbara Serba, and spirits soared throughout the entire weekend. Barbara purchased a beautiful statue of Our Lady of Fatima as a gift to the new chapter and under her patronage, wonderful things came to pass. With a turnout at the first meal of over 200 women, and over 300 at the most recent in May of 2017. The Advisory Team began to form. Soon there were regular attendees who were signing up to work within the various committees. While the early days were very challenging, the women were shown at every turn, that this work is the work of Our Blessed Mother. There were many miracles, signs and wonders along the journey. The bond established within the team under the mantle of Our Lady Cause of Our Joy is a treasure that has grown stronger and sweeter over time. A gradual but truly wonderful transformation takes place once one sets her hand to the plow in Mary’s lovely garden.